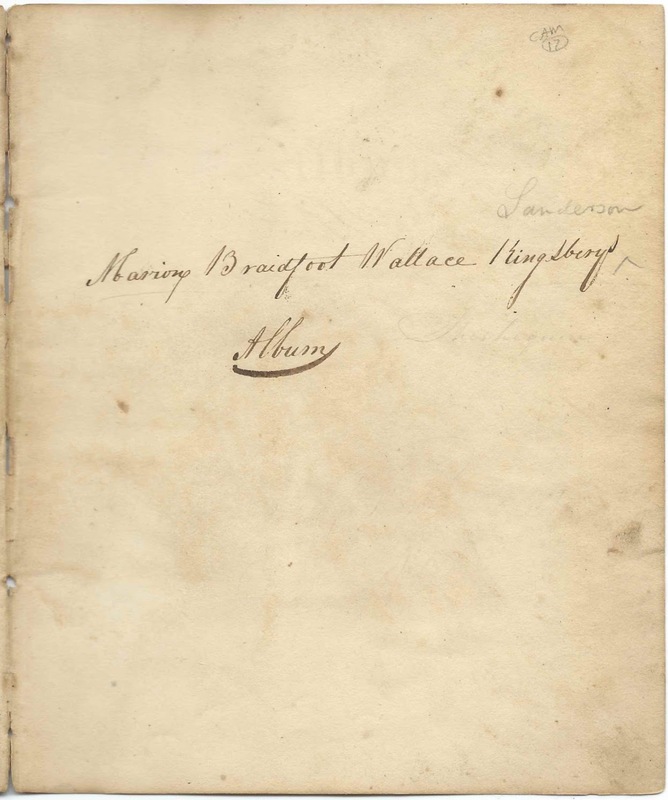 1830s autograph album/journal that belonged to Marion Braidfoot Wallace Kingsbury of Sheshequin, Pennsylvania. Marion copied many poems and several pages of French vocabulary in her album, in addition to acquiring sentiments. The album is mostly unbound and is missing some pages, by accident and by design. In two places, several pages in succession were cut away. I don't know if they were removed by Marion or by someone after Marion's death in 1886 up to the time that I purchased the album. The title page is missing but its impression stayed with a page that still remains. The album measures approximately nearly 8" x 6-1/2" and contains the sentiments of over twenty of Marion's relatives and friends, with the total hard to determine because many poems appear in the album, and the names on the page might be that of the author rather than an inscriber. I was able to determine that some of the names were the authors of the poems that Marion copied down, and those names don't appear in the list of inscribers. 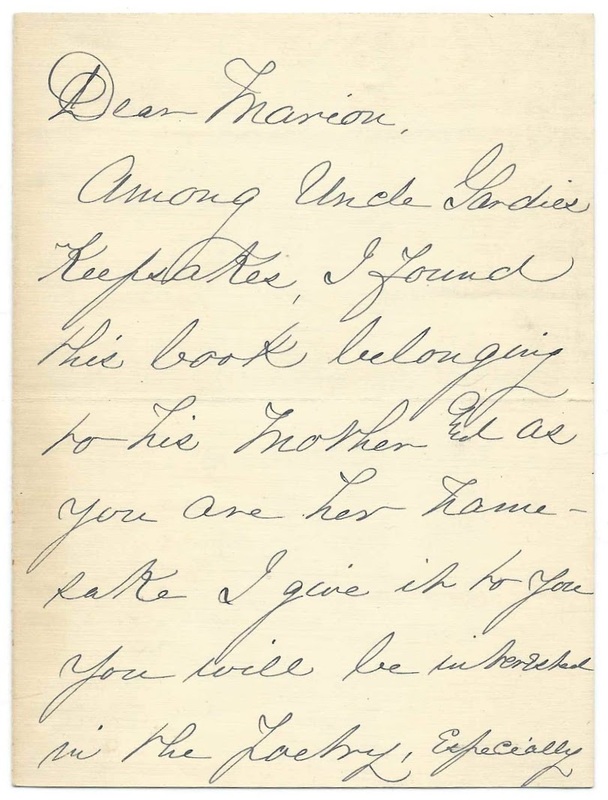 The album also includes a few items tucked in, including a more contemporary letter explaining that the album is being gifted to the niece of the man whose mother originally owned it because the giftee was named for Marion Braidfoot Wallace Kingsbury. I believe the man, "Uncle Gardie", was James Gardner Sanderson, Marion's second child with husband George Sanderson. "Dear Marion, Among Uncle Gardie's keepsakes, I found this book belonging to his Mother and as you are her namesake, I give it to you. You will be interested in the poetry, especially the lines written by your great grandfather. I hope the picture arrived in good condition. I tried to frame it in as old-fashioned style as possible. I added the dates as I thought that would be more interesting. Awfully sorry to know you have been so ill. I miss your bright face and only wish you could have settled near us. Aunt Anna is going to send up on the hill so I am hurrying these few lines to you with a Merrie Xmas and love to both. Aff. Aunt Lizzie, December Nineteenth." Marion Braidfoot Wallace Kingsbury was born September 30, 1815 at Sheshequin, Pennsylvania, the daughter of Col. Joseph Kingsbury and Anna (Spalding) Kingsbury, daughter of General Simon Spalding and Ruth (Shepard) Spalding. 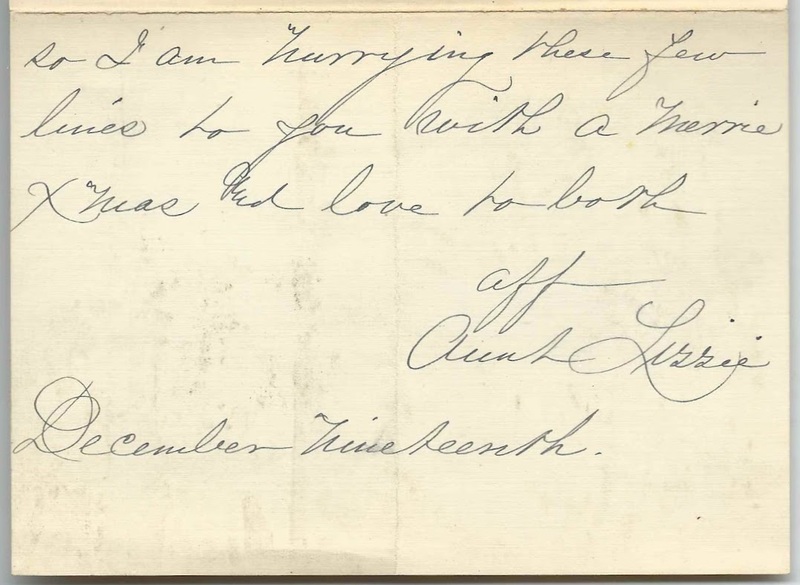 As noted in the letter, one of the items tucked in the album was a scrap of paper attributed to Joseph Kingsbury, whose parents were Lemuel and Alice (Terry) Kingsbury. Marion Braidfoot Wallace Kingsbury married Boston, Massachusetts native George Sanderson in late September 1835, possibly at Sheshequin, Pennsylvania or possibly at Geneva, New York as mentioned in an online history of the Sturges family]. George was born February 25, 1810 at Boston, the son of Jacob and Jerusha (Gardner) Sanderson. George was an attorney, district attorney, banker and developer, as well as a state senator. He was an early mover and shaker at Scranton, Pennsylvania. One page in the album has information on the first three births. It appears that Lemuel was considered for James' name. Marion and George died within months of each other in 1886 and are buried at Forest Hill Cemetery at Dunmore, Pennsylvania. If you have corrections and/or additions to the information above, please leave a comment or contact me directly. I.; signed in January 1835; could be J.
Amelia; possibly but not necessarily Amelia Ann (Mix) Barstow. Helen, inscribed at Sheshequin, Pennsylvania, on May 18, 1834. Perhaps Marion's younger sister Helen Mar Kingsbury [or Helen Mar Kingsbury]. Can't make out name - possibly Matilda or Matildy or ? If so, interestingly, Marion's brother Joseph Kingsbury, Jr., married Matilda Mix; and brother Henry Kingsbury married Matilda Clisby. D. F. Barstow, signed at Towanda, Pennsylvania, on September 14, 1831. Presumably David F. Barstow, who married Amelia Ann Mix, wife of Marion's brother Joseph Kingsbury, Jr.
Adelaide D.; she wrote some lines in French. J. H. In. The J could be an I, and the H could be a K. The name could represent an inscriber or could be the author of the poem "The Rainbow"
Marion Braidfoot Wallace Kingsbury of Sheshequin, Pennsylvania; album owner. On the ownership page, someone, presumably Marion, but not necessarily, added the name Sanderson, which was the surname of Marion's future husband George Sanderson. Marion copied poems onto many pages in the album; one of them she dated 1834 at Sheshequin. Scrap of paper tucked in: Sentiment written, according to a later note, presumably written by one of Marion's children, by Joseph Kingsbury, father of album owner Marion Braidfoot Wallace Kingsbury. Matilda M. Kingsbury - her name appears on a page with those of Amelia A. Mix and Helen Mar Kingsbury - presumably written by Marion herself. Matilda (Mix) Kingsbury was married to Marion's brother Joseph Kingsbury, Jr.
Helen Mar Kingsbury - her name appears on a page with those of Matilda M. Kingsbury and Amelia A. Mix - presumably written by Marion herself. Helen was Marion's sister. Amelia Ann Mix of Towanda, Pennsylvania. She married signer Daniel F. Barstow and was the sister of Matilda (Mix) Kingsbury, wife of Marion's brother Joseph Kingsbury, Jr.
Amelia A. Mix - her name appears on a page with those of Matilda M. Kingsbury and Helen Mar Kingsbury - presumably written by Marion herself. Amelia Ann Mix was the sister of Matilda (Mix) Kingsbury. She would marry signer David F. Barstow. 2-page Dedication by A...h P. Pelton, inscribed at Sheshequin, Pennsylvania, on January 23, 1831. The initial P may have stood for Pelton, and the surname may have then been spelled out. She did not sign a page herself, but the name Emily Eliza Sanderson and her birth date and place were recorded in the album/journal. Emily was the daughter of Marion Braidfoot Wallace (Kingsbury) Sanderson and husband George Sanderson. He did not sign a page himself, but the name James Gardner Sanderson and his birth date and place were recorded in the album/journal. Interestingly, the name Lemuel is crossed out. James was the son of Marion Braidfoot Wallace (Kingsbury) Sanderson and husband George Sanderson. He did not sign a page himself, but the name George Sanderson and his birth date were recorded in the album/journal. George was the son of Marion Braidfoot Wallace (Kingsbury) Sanderson and husband George Sanderson.